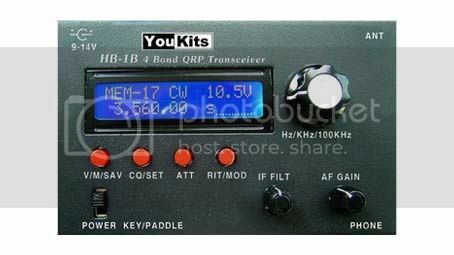 We will shortly be taking delivery of the new exciting QRP transceiver from YouKits covering the four bands 80m – 20m. This CW transceiver delivers 5 Watts of effective power as well as general coverage receive from 3.2 – 16MHz (CW & SSB). This new model has not only added two additional bands, it also now features continuously variable selectivity in conjunction with xtal filter. It has many other interesting features including 30 memories, RIT, Automatic CQ with your call sign, Attenuator, Steps of 10Hz, 100Hz and 5kHz, IF filter from 400Hz – 3kHz, built-in electronic keyer, and a lovely clear LCD display. External 9 – 12v gives up to 5W output and 14v (max) around 7 Watts. Receive drain is approx 60mA. There is provision for using 3 x LS14500 lithium cells internally – not included. Size: 132 x 85 x 35 (mm). Weight 380gms. The first batch are due early November – so phone to reserve yours. We have now received the first sample of the new FG-01 antenna analyser covering 1 – 60MHz. It is powered by internal rechargeable Lithium cells or can be powered from an external 10-12v source. The colour graphic display provides a clear indication of VSWR across the selected bandwidth. Bandwidths can be set from 100kHz to 50MHz in preprogrammed segments. The centre frequency can be adjusted in steps from 1kHz to 1MHz. Steps and scanning ranges are selected by briefly pressing the tuning knob. As well as the graphic display the panel also indicates absolute VSWR values together with battery voltage. 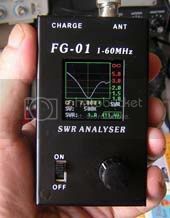 The FG-01 is designed to be a very portable way of quickly and accurately measuring VSWR and showing multi resonant points on antennas such as dipoles and beams. It makes antenna adjustment very easy. We have tested it on a number of antennas and even found that there was a fault on our HF beam antenna we had not realised! Once you have used an analyser with a graphic display, you will realise how much more information you can get on one screen and immediately see how adjustments on one band can affect another. Waters & Stanton have been appointed sole distributors of the first of these new HF transceivers from China. The HB-1A-MK3 transceivers offers 2 band coverage with up to 5 Watts output. It includes a digital display, built-in CW keyer with auto CQ and switched bandwidth filters. Designed very much with the portable QRP operator in mind, it can be run from internal cells or external 12v system. There are two models available, the HB-1A-MK3-40-20 which offers 40m & 20m and the HB-1A-MK3-30-20 which offers 30m & 20m. This radio is sold in the USA under the TenTec banner. The China factory has now appointed Waters & Stanton as their exclusive UK distributor and this radio will be the first of a range of HF models. Look out for the new 6-band HF rig SSB and CW!